Boss Keith Curle has praised the Cobblers’ medical team as well as the professionalism of Sam Foley and Marvin Sordell off the back of the duo’s return to first team action at Stevenage last weekend. Midfielder Foley had been out of action since the 3-0 win over Carlisle January 12 due to a back problem, but he was reintroduced as a second-half substitute at Broadhall Way. Striker Sordell hadn’t featured since making his debut in the 4-0 loss to Colchester on February 2, a match that had been his first since mid-November due to a knee injury. The fact the pair were ready to return to the first team after minimal training impressed Curle, and he praised the joint effort of the players and the club’s backroom staff. “Sam Foley is still on a return to 90-minute match football protocol,” said Curle. “He has been training, and some the lads have had a couple of down days where the intensity hasn’t been as high, but Sam has been in because he still needs match fitness, and still needs to get up to speed. “It’s the same with Marvin Sordell. “It was fantastic to be able to get him back out on the pitch last weekend, and I think that is testament to the lad. “He has been out injured for a long period time, he came back and played a game and had a slight recurrence that kept him out again for a few weeks. “But when he was out injured he was still working, and that shows the good work that is being done behind the scenes by the strength and conditioning and medical department. “They know when the players are back out doing field-based training then if it’s right I will pick them. Both Foley and Sordell will be hoping to be in the mix again this weekend when the Cobblers travel to Crewe Alexandra. Right-back Shay Facey is still struggling though. 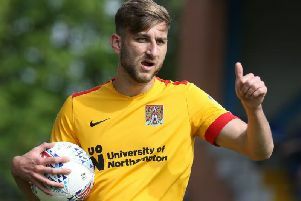 The former Manchester City has missed the past two games, and was not involved in Tuesday’s reserve team friendly with Milton Keynes Dons at Moulton College. Aside from Facey, the only other absentee is left-back George Cox.